When your holiday party calls for grown-up appetizers, but you don’t have grown-up patience or adult-level skills, try these. 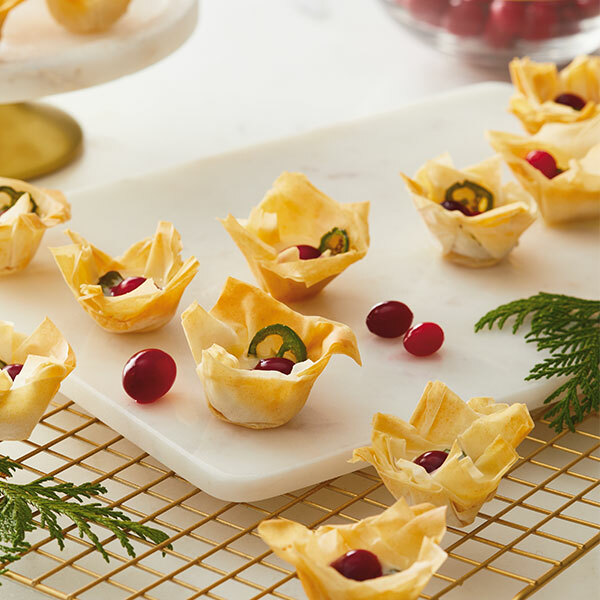 Baked Brie Phyllo Tarts are easy to make and look gorgeous: Just fill ready-made pastry shells with a super-simple cranberry sauce and brie. The unusual-but-delicious combo of creamy Brie with tangy cranberries and the heat of the jalapeno slices will call to your foodie friends from across the buffet table. Seed and mince the jalapenos. Combine sugar, water, cranberries and ½ of the minced jalapenos in a saucepan over medium high heat. Boil for 10 minutes, stirring occasionally. Allow to cool, then refrigerate until serving. To serve, preheat oven to 350. Pulse the brie, including the rind, in a food processor until well mixed. Scoop 2 tsp. brie into each phyllo shell and set on a baking sheet. Top with one 2 tsp. cranberry sauce, sprinkle with additional minced jalapenos.